Even before the first round, all the polls had Macron pegged to win the second round 60/40. 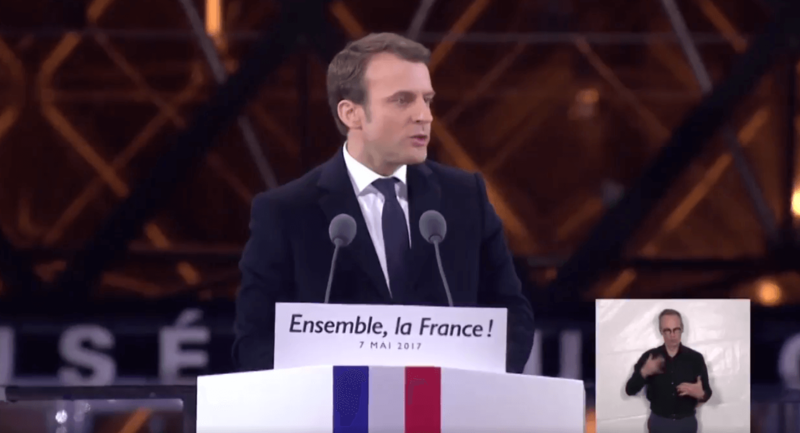 But then, between the rounds, Le Pen seemed to be nibbling away at Macron’s lead – not by much, but by enough to cause some butterflies among her opponents. Macron appeared lacklustre at a crucial time. Fears of a low turnout and Jean-Luc Mélenchon’s refusal to formally endorse Macron also threw a number of unknowns into the mix. A high abstention rate would play in Le Pen’s favour, went the reasoning. Her electors, as far as anyone could tell, were more committed. In the end, turnout was indeed lower than expected (and there were 4m spoilt ballots), but it did not hinder Macron. Quite the reverse. With an estimated 65.1% of the vote to Le Pen’s 34.9%, Macron has come away with the second highest second round score in the history of the Fifth Republic. So, now France has a president whose priorities are to tackle chronic unemployment by relaxing labour legislation and introducing a raft of measures to help young people into work, to reduce primary school class sizes to 12 pupils per teacher, to relaunch the European project in collaboration with France’s partners and to simplify the mind-bogglingly complex tax and pension set-up for French citizens. Deep down, Le Pen knew she didn’t have the tail wind to take her to victory after a disappointing first-round result. She had hoped to go through in first place but finished second behind Macron and only 650,000 votes ahead of François Fillon. This goes some way to explaining her extraordinary performance in the presidential debate on May 3, where she cast aside the opportunity to present her programme in favour of a non-stop attack on Macron. He might not have looked presidential all the way through the debate, but she certainly looked like she was making a bid to be the leader of the opposition rather than the tenant of the Elysée. In any case, it looks like the debate cost her 5% of the vote. It certainly caused consternation among her supporters. And yet her score is historic. Throughout the campaign she was the one candidate we all assumed would get through to the second round. Her total of 11m votes is twice what her father managed in 2002 – and 5m more than she herself scored in 2012. On Sunday evening, about ten minutes after the result was announced, Le Pen made a two-minute speech to a small group of party activists, accepting her defeat, but also launching herself as the head of the “première force d’opposition” and promising a transformation of the Front National for the general election in June. She neglected to explain what that means, but she will almost certainly seek to destabilise Les Républicains by appealing to the right of the party. Meanwhile, after a celebration at the Louvre on Sunday night, Macron will await his formal investiture as the eighth president of the Fifth Republic at the beginning of next week. By tradition, the incoming president announces the name of the prime minister only on the following day. Macron may break with this and make the announcement a little earlier, but there are still calculations to be made. The electoral process isn’t quite over for the French. Can they survive the risks of electoral burn-out? For now, at least we can all savour what has been an extraordinary campaign and reflect on where France goes now. Paul Smith, is an Associate Professor in French and Francophone Studies, at the University of Nottingham.